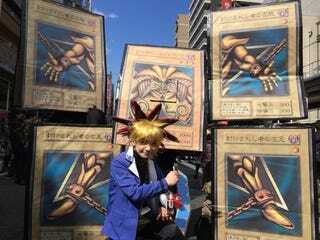 Today, Osaka's geek district Nipponbashi held a big street festival. The area's main drag was closed off to cars, allowing cosplayers to roam free and cause all sorts of cosplay chaos. Every year at this event in particular, the costumes get more and more outrageous (though, there are some old favorites on display below). Either way, I love playfully fun cosplay! Many Japanese Twitter users, such as mamerialyuuyaaa were on hand, snapping pics for all to see. Let's have a look.